One bite of this fruit pizza and you’ll be kicking yourself for not making it sooner! 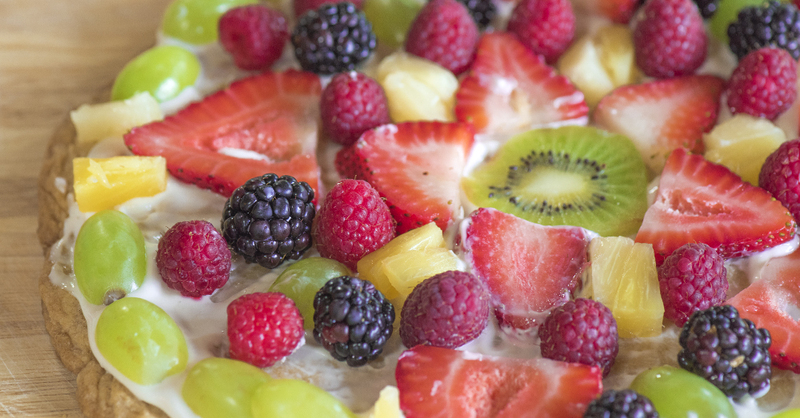 Made up of a sugar cookie crust, then topped with vanilla Greek yogurt and all the fruit you could ever want (arranged in a very pretty pattern, naturally), this dish is perfect for a light brunch or dessert. We got the little ones in our life involved – they were able to help with everything that didn’t involve the oven – and had a great morning in the kitchen. The finished result was beautiful and delicious, and the kids were thrilled that they made something so yummy! Preheat oven to 350º F, and lightly grease a rimmed baking sheet (or line with parchment paper). In a large bowl, whisk together sugar cookie mix and flour, then beat in butter. Mix until dough is the consistency of small pebbles, then beat in egg until smooth and incorporated. Transfer dough to greased/lined baking sheet and use your hands or a flat surface to press it to 1/2-inch thickness. Place baking sheet in oven and bake for 15-17 minutes, or until golden. Once cool, spread vanilla yogurt over the cookie crust, then arrange as desired with fresh fruit.